Instagram has officially announced that it is rolling out ‘archive’ option for Android and iOS users to hide posts from profile easily without deleting them feature for everyone. This will be very useful for those who want to hide some of their pictures or videos from their profile temporarily. You’ll still be able to see it when you tap the Archive icon in the top right corner of your profile. Once you’ve archived a post, you can choose to show it on your profile again. The post will return to its original spot on your profile. To show an archived post on your profile, tap “Show on Profile” at any time and it’ll show up in its original spot. 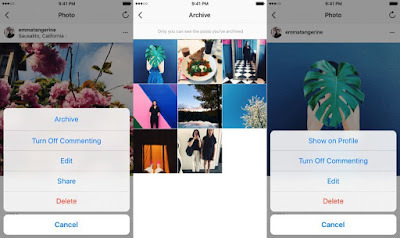 The new feature is available on Instagram v10.21 and above for iPhone and for Android.